Today is the last day of year 2010, and I spent half of the morning in the markets. Not because I was doing some last minute holiday feast shopping, but because I realized that we still have to eat for a few days or so after the new year celebration and before my much-awaited moolah arrives. The cupboards are well-stocked for the holidays, but most of their contents will be used up tonight. I started hoarding goods as early as November, but since I couldn’t keep meat and veggies for long, I have to go out from time to time to get fresh supplies. Too bad though that one of those times happened to be to-day! My first stop was the wet market near us to buy some rice and eggs. This particular market is usually empty since the goods sold there are usually higher than the market 30 minutes farther, but it was very crowded this morning. After getting what I needed, I transferred to the biggest supermarket in the village. It’s near the wet market and it is where I usually shop because it offers more goods than the other supermarkets in the area. Moreover, its ambiance is much nicer compared to others. You see, our village houses numerous supermarkets and mini groceries, as well as convenience stores that I often wondered how they get to earn. This kind of setting also allows shoppers to shop with ease, since the lines to the counter don’t usually get too long. Yet today, you’d think that this supermarket was the only store in the area. I was on the verge of leaving my basket of bread, cereals, milk, chicken, fish, and chips, when I realized that the grocery stores might open very late tomorrow or might not open at all because it’s a holiday. Besides, I had an iPhone to keep me company–thanks to my hubby who had downloaded music and movies to it before giving it to me–and I was surely not alone, so why not just get on with it, I thought. And as I looked around the supermarket, I realized a few things that seemed inherent to most Filipinos, it seems. 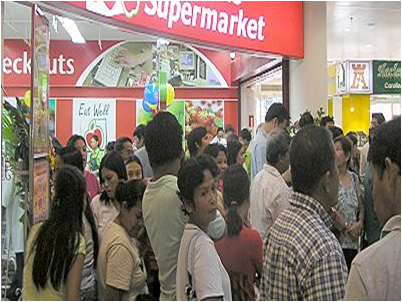 One, Filipinos do tend to do last minute shopping. I overheard someone exasperatedly remarked that there was no graham crackers available. I felt like saying, “Haler! The ingredients for your tiramisu / mango float / refrigerator cake ala graham” don’t get easily spoiled, so why do you have to wait until the last minute to gather your ingredients?” After all, I have my own ingredients for one of those recipes tucked away in the cupboards at home for a couple of months now. Three, trust Filipinos to be ingenious, but don’t ever think that their ingenuity is always beneficial to others. Basket lanes were specifically created for shoppers who do not have much to buy; thus, they only have to use baskets and need not suffer the long wait where shoppers with carts full of groceries also line up to pay for their goods. Yet today, the usually swift basket lanes or express counters were the ones that had the longest lines since shoppers who had large grocery carts filled to the brim would transfer their goods to the baskets. Worse, the supermarket staff could see what these shoppers were doing, but couldn’t reprimand them. After all, their goods were already being transferred to baskets and they were in the basket lane. I wonder if I will observe the same scenarios next year. Hopefully not, as I have learned my lesson never to shop on a day like this. Nevertheless, it had been an amusing experience which prompted me to think about my being a Pinoy–something that I rarely do now.